Powerbrace molded polymer hinges are the only “plastic” trailer hinges on the market. They are lighter than aluminum and won’t rust or corrode like metal. 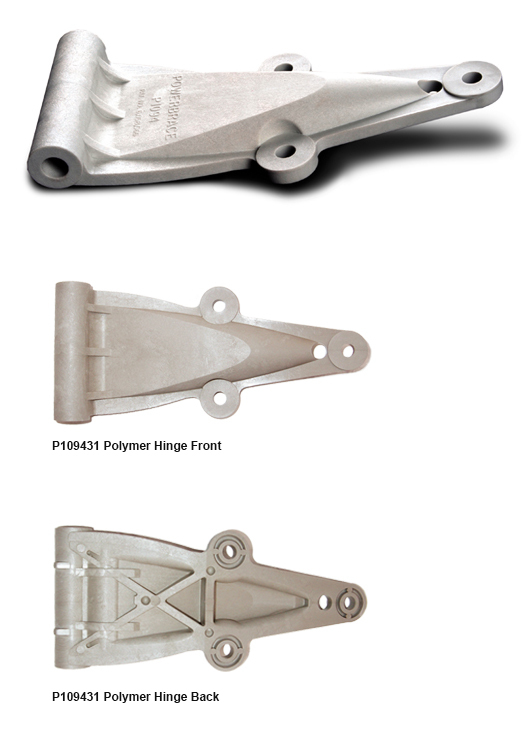 Our polymer hinges derive their strength from the honeycomb-molded construction shown below. This structure maintains strength, but uses less material mass, thus reducing weight. Polymer hinges don’t require mounting gaskets and since they are non-metallic, they don’t require washers for mounting. Our Polymer hinge is designed to break away on impact when doors are open, thus saving expensive doors from damage in docking collisions, etc. Since polymer is a non-metal, the hinges will never corrode or rust. No mounting gaskets are necessary. Available in standard gray or can be colored to match virtually any trailer color. Minimum quantity required for non-standard colors. • Smooth door operation without lubrication, even after long periods of non-use. Performs under the most severe weather and road conditions. • Matches up with conventional Powerbrace 4-inch hinge butts. • Eliminates washers for easier door assembly. • Molded polymer, made of impact modified nylon. 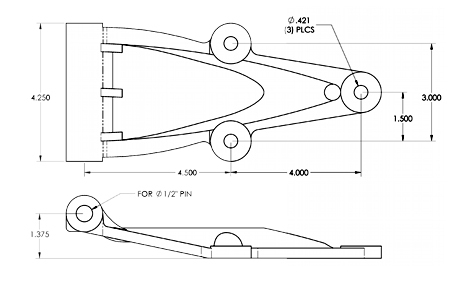 • Standard Powerbrace 3-hole bolt pattern allows for interchangeability with conventional Powerbrace hinges. • Weight – 9 oz.